Book your trip with our easy online booking located at the bottom of each captain's page, or call 1-855-9HOOKIT ! Scroll down and click on one of our beautiful destinations to view all available charters and book today! Crystal River and Homosassa Springs are hidden gems of Florida's west coast! Located just over an hour from Tampa, you'll find fantastic flats, inshore, and backcountry fishing. You'll also find amazing manatee encounters and eco-tours. And don't miss the summer scallop season! Crystal River Fishing Charters is something for everyone. Destin is a city located in the Florida panhandle, boasting miles of sugar white sands kissed by the emerald green waters of the Gulf of Mexico. Destin Harbor is the home to the largest charter fishing fleet in Florida, called "The World's Luckiest Fishing Village!" Charter fishing in Destin is some of the best fishing Florida has to offer! Guatemala, a Central American country south of Mexico, is home to volcanoes, rainforests and ancient Mayan sites. The capital, Guatemala City, features the National Palace of Culture & National Museum of Archaeology & Ethnology. Come alone, or bring your friends and family and find yourself falling in love with Guatemala! Charter Fishing in the Keys is a must when you visit these amazing islands. The Florida Keys are a famous sportfishing and diving destination. They are home to some of the world's best charter fishing captains and dive captains, and are a great spot for both offshore and backcountry charters. Spend the day charter fishing in Miami for sport, food or fun! From the shallow flats of Biscayne Bay & Everglades National Park to the depths of the Atlantic Ocean, Miami is a charter fishing paradise. Come join the fun in the sun! 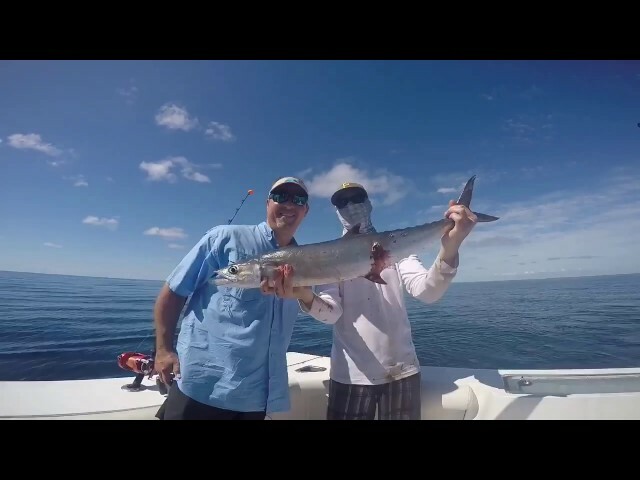 Miami Charter Fishing is the best charter fishing in Florida! Grab your sunglasses and get ready to HookIt! Naples is a city on the Gulf of Mexico in southwest Florida. The Naples Pier, first erected in 1888, is the city’s symbol, and is a popular fishing and dolphin-spotting destination. But go beyond the pier with one of our charter fishing captains or eco-tour guides to experience all the beauty and excitement that Naples has to offer! Orange Beach charter fishing is some of the best along the Gulf Coast! Knowledgeable captains navigate the backwater bays yielding catches of Speckled Trout, Flounder and Redfish. Offshore fishing in Orange Beach is likely to bring giant Tuna and Marlin. Whether it's an inshore or offshore fishing trip, exciting, fun-filled memories await! Pensacola Charter Fishing is a must when you visit Pensacola / Pensacola Beach. Pensacola is famous for its white sand and emerald green waters. The Gulf of Mexico and Pensacola Charter Fishing offer endless opportunities for any angler. For those who are looking for variety and action-packed adventure, charter fishing in Pensacola will not disappoint! Call 1-855-9HOOKIT and book your charter today!